If you are not hearing impaired, you might be asking yourself, what’s in this for me? As we have now been hinting at for some time, the path to the cyborg-enhanced transhuman is being paved by the bionic ear. Sure DBS implants can dramatically short-circuit a debilitating tremor, and let those afflicted eat a steak dinner unscathed, but the average Joe won’t be wanting one of them anytime soon. On the other hand, the new Nucleus 6 auditory prosthesis from Cochlear now offers some incredible new features with a much more universal appeal. Cochlear has just announced CE mark approval (compliance for sale in the European market) for the Nucleus 6. Among its new features are the industry’s first automated auditory scene classifier, known as SCAN, which analyses the soundscape and automatically applies the appropriate filters to optimize hearing performance. In the past users had to constantly fiddle with the settings on their devices when sound environments changed. Seamless and rapid adjustment when noise sources confound the main signal — such as wind or machinery – can now provide hearing aid or implant users with an optimal solution. Those signal processing features are nice, but for normal folks, or the only slightly hearing-impaired, what grabs the attention here is that for the first time, peripheral devices have been properly integrated into an implant. The Nucleus 6 delivers the first truly wireless capability where multiple sound sources can be streamed directly to the processor without intermediary body-worn devices. 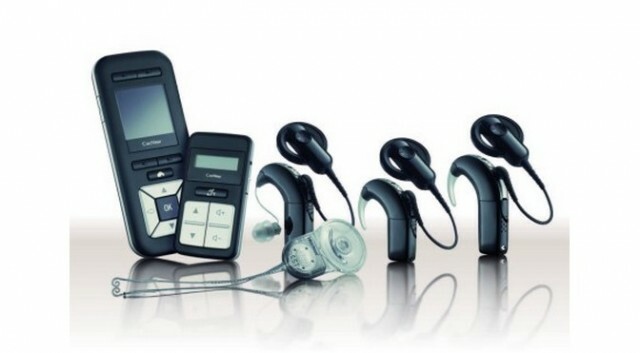 The device can simultaneously pair with two Bluetooth sources, and a range of Cochlear wireless accessories including remote microphones, TV streamers, and phone attachments. To most of us, incorporating these rudimentary connectivity solutions seems obvious, but to the medical device world, they have been slow to be realized. Compared to the complex sound processing wizardry like spectral identification of sound sources, or noise cancellation, incorporation of smart connectivity seems like a no-brainer. But alas, until now no good options have been provided. In the absence of readily available integrated solutions, neurohackers like Rich Lee have begun to add peripheral sound streams in the form of magnetic headphones. This device beams sound signals to magnets implanted in his tragus (the fleshy bump at the front side of the ear canal). Unfortunately, an obtrusive electromagnetic necklace is needed to actuate the magnets, and as with any implant, MRI-compatibility is not fully predictable. The Nucleus 6 has additional provisions for data logging, which unfortunately are primarily targeted for physician oversight. However, as we have recently seen with pacemakers, opening up the implants so that users have more control over their functionality and data logging first requires the implant to have features that the user wants and needs. At the end of the day, this won’t be the device that you need to get a data plan for, however when the deaf or hearing impaired are seen to have a richer auditory experience than normal folks, demand for those capabilities through elective bionic augmentation will be high.